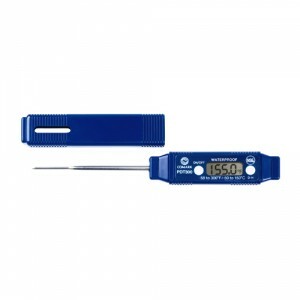 The 300 Digital Temperature Probe has a 1.5mm thin tip for fast response. 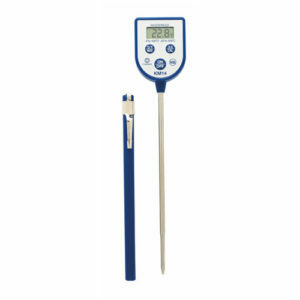 With large digits it is an easy-to-read and easy-to-use thermometer for quick checks when cooking a range of foods. 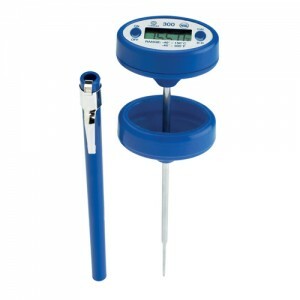 There is a hold button on the temperature probe which enables the user to hold the digital reading on the screen while they note a measurement. 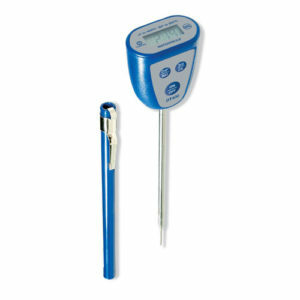 The 300 Digital Temperature Probe is also water-resistant. 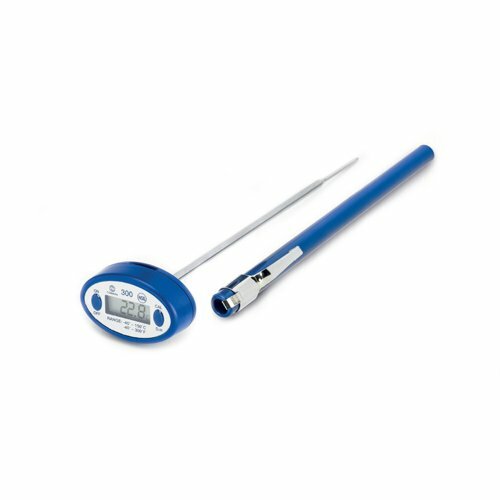 The 300 Digital Temperature Probe is a basic reduced (thin) tip Thermometer with Biocote Antimicrobial Protection. The 300 is slim and lightweight, which makes it perfect for slipping into shirt, trouser or apron pockets between use. It has a 127mm / 5″ long stem and a 1.5 mm / 0.6″ diameter then tip, making it suitable for probing thinner foods. The 300 Digital Temperature Probe is field calibratable and features °F/°C switchable temperature scales/ranges, a data hold function and a low battery indicator. You can either use the <<ON/OFF>> button to conserve battery life or let the unit automatically shut off after a short time. 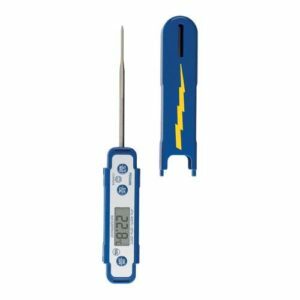 This Pocket Digital Thermometer includes a protective case with pocket clip and a battery. The 300 is also available with a Rubber Boot, click here. 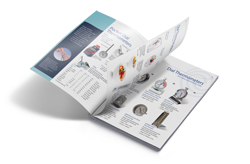 The 300 Digital Temperature Probe features °F/°C switchable temperature scales/ranges. With the thermometer turned ‘off’, press and hold the <<ON/OFF>> button. Release when the desired scale is shown. Note: This is the procedure for any Pocket Digital Thermometer that does not have an °F/°C (Scale) button. Stem Length 127mm / 5"